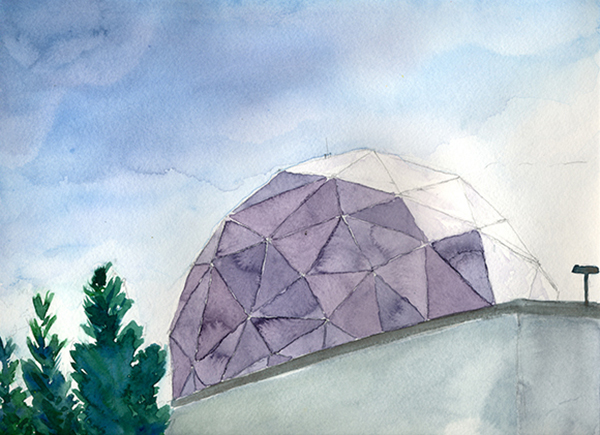 On a sunny day a few weeks ago in late September, a group gathered to draw and talk on the grounds of Northrop Grumman's Space Park Drive facility, their aerospace headquarters in Redondo Beach. In the group were several artists, geographers, an historian and urban planner. Our goal? To contemplate looking, drawing, recording, and representing landscape at the home of military "sight." Sitting on the grass next to the TOTS - Telemetry and Orbital Testing Station across the street from a radome atop a tall industrial building, we considered some of the specific viewing and view-jamming technologies developed there. For example, engineers, technicians and others are working on stealth technology, also called low observable technology, which is designed to hide military vehicles and people (on land, sea and air) from radar, sonar, and infrared detectors. Engineers there are also developing the HART, that is, Heterogeneous Airborne Reconnaissance Team system, which the Northrop Grumman web site explains, "autonomously manages a large mix of manned and unmanned aircraft and sensors and distributes streaming video, surveillance and reconnaissance information to war fighters in the field." With systems like this, the military gathers imagery and related spatial data (including the location of the place pictured, for example) from satellites, videos shot by weapons guidance systems, reports from fighter pilots, and other sources. This information is then used to make decisions about battlefield manoeuvring and targeting. Our discussion provided the group with a point of reference for comparing our experience on the ground viewing and drawing the Northrop Grumman Space Park Drive facility with the aerial perspectives of far-off conflict zones generated here. We traced the arc of this imagery developed at this site, acted upon elsewhere, and our place within war zones -- the roles of representation in fighting and understanding them. As artists, we are intrigued to ask what role do imagery and image making processes play in defining the physical geographic boundaries as well as the conceptual identity of the nation? To explore this question further, we will be drawing and otherwise metaphorically tracing at the US Mexico Border in the upcoming weeks.